AccuPOS is a technologically progressive POS solution that is fully compatible with the mainstream accounting systems including QuickBooks and Sage. If you are looking for powerful accounting software that will offer powerful reporting capabilities, then this is an excellent choice. This platform offers inventory management, customer relation management, and employee time/attendance modules that make it easy for you to engineer customer loyalty program, adjust inventory, issue gift cards, access online reporting, and add customer notes and comments. AccuPOS is designed to streamline restaurant operations and is fully compatible with Android devices for portable accessibility. Using the mobile platform you can easily and quickly process cards and enter food orders from anywhere within the premises. Besides, this software is available in web-based and on-premise format which makes it awesomely versatile. AccuPOS is a truly innovative software and one of the very few that is compatible with both QuickBooks and Sage. It has set these two major accounting packages as the centerpiece of its operations while taking a pivotal role to fill the gaps with its seamless POS software. It’s easy to use the platform thanks to the simple and friendly interface that gives you the freedom to fly through with lighting speed. The platform is also fully customizable and you can separate hot keys and buttons into easy tabbed menus which can be color coded to your liking. AccuPOS delivers fully customized and standard reports which are essential in helping you to establish the numbers that matter to your business. Moreover, the simple login into the POS system gives you full access to manage and monitor your business even when away from its physical location. This software provides a fast and accurate tableside service for your customer and effective mobile credit card processing and scanning. You will also be able to take deliveries wirelessly, handle pricing, and amend your inventory account thanks to the convenient AccuCOUNT inventory management feature. AccuPOS also enables you to emails receipts to customers thereby saving your papers and helping to build a resourceful customer database which is great for marketing campaigns. 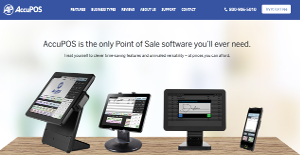 Each company is different, and may require a particular type of POS Software solution that will be fit for their company size, type of customers and staff and even particular industry they deal with. It's not wise to count on getting an ideal app that will be suitable for each company no matter what their background is. It may be a good idea to read a few AccuPOS reviews first and even then you should pay attention to what the solution is intended to do for your business and your staff. Do you need a simple and straightforward solution with only essential features? Will you really make use of the complex tools required by experts and large enterprises? Are there any specific features that are especially beneficial for the industry you operate in? If you ask yourself these questions it is going to be much easier to get a solid app that will match your budget. How Much Does AccuPOS Cost? We realize that when you make a decision to buy Restaurant Management Software it’s important not only to see how experts evaluate it in their reviews, but also to find out if the real people and companies that buy it are actually satisfied with the product. That’s why we’ve created our behavior-based Customer Satisfaction Algorithm™ that gathers customer reviews, comments and AccuPOS reviews across a wide range of social media sites. The data is then presented in an easy to digest form showing how many people had positive and negative experience with AccuPOS. With that information at hand you should be equipped to make an informed buying decision that you won’t regret. What are AccuPOS pricing details? What integrations are available for AccuPOS? If you need more information about AccuPOS or you simply have a question let us know what you need and we’ll forward your request directly to the vendor.